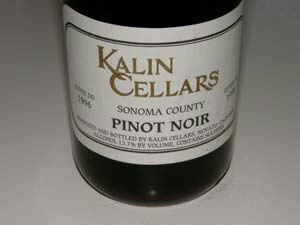 Microbiologists Dr. Terry Leighton and his wife Dr. Frances Leighton founded Kalin Cellars in Marin County in 1977. Terry was a professor of microbiology at University of California Berkeley when he became the original winemaker at Domaine Laurier in the 1970s prior to starting his own label. The first wines, a Zinfandel and Cabernet, were released in 1978. Over the ensuing years, the Leightons have labored in relative obscurity producing some of the greatest California wines that only wine critics and wine geeks can testify to. The eccentric couple avoid publicity at all cost. I have been enamored with their wines for years because of their unique character, age ability and individuality. 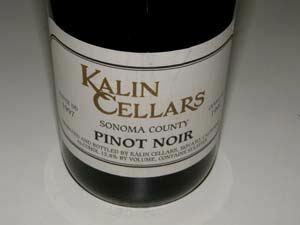 The wines at Kalin Cellars are all single vintage, single vineyard wines. The Leightons own no vineyards of their own, but source grapes from distinguished vineyards outside Marin County. 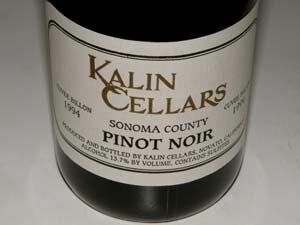 An exception was the use of Pinot Noir grapes from Marin County’s Devil’s Gulch Vineyard (farmed by Mark Pasternak) in 1987 and 1988. The Leightons produced sparkling rosé in those two vintages that are legendary among wine enthusiasts. The Leightons own and farm two vineyards in Beaune, from which Frances oversees the production of 80 cases of “Kalin Bourgogne” that is sold to “Kalinites,” and restaurants. The Leightons do all of the winery work themselves. Because of the style of winemaking, the wines are not ready to drink for at least five years. Unheard of in the modern business model of wine sales, they follow no set vintage sequence. Basically, the wines are released to the market when the Leightons feel they taste good, usually between 5-10 years after the vintage. 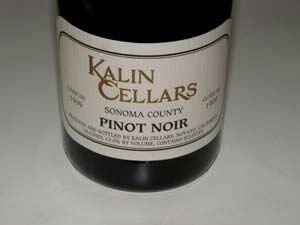 The current (2007) Pinot Noir release is the 1996 Kalin Cellars Cuvee DD Sonoma County Pinot Noir (the 1997 vintage was released in 2006). In essence, then, every wine that is released is a library wine! Wine writer Robert Parker has called Terry Leighton "one of Calikfornia's two most talend winemakers" and his products "the wines of a genius." Terry is now retired from his professorship but continues to do scientific research at Children's Hospital in Oakland. 7,000 cases of wine are produced annually usually consisting primarily of a Sonoma County Pinot Noir and Chardonnay and a Livermore Valley Semillon. Cabernet Sauvignon, sparkling wine and dessert wine have been thrown into the mix in some vintages. 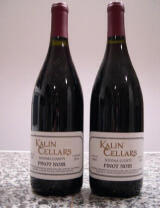 Kalin Cellars has several vintages available in the retail and auction marketplace: 1991, 1993, 1994, 1996, 1997 and 1999 Pinot Noir and 1996, 1997 Semillon. The wines are sold by inquiry through the website or phone, 415-883-3543.